Now in its fourth year, the Antwerp Diamond Trade Fair has become firmly positioned on the annual calendar of the world’s most important global trade shows. 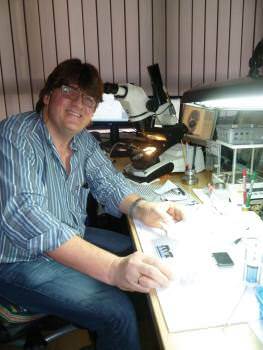 For more than 400 years, diamantaires in Antwerp conducted their business in private. That all changed in 2010 when they opened the doors of the historical trading halls of the 105-year-old Antwerp Diamond Bourse and the even older Antwerp Diamond Club to buyers at the first Antwerp Diamond Trade Fair (ADTF), who were able to come and see some of the largest selections of polished diamonds in the world. And, every year since 2010, the ADTF has grown in stature as well as in the number of exhibitors and buyers. Now in its fourth edition, the ADTF is still organized on a by-invitation-only basis. 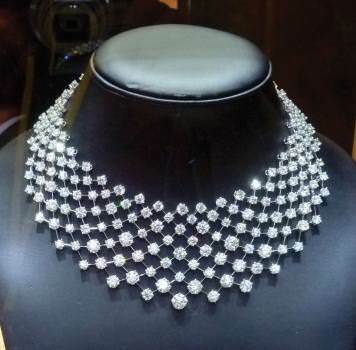 The show is sponsored by the Antwerp World Diamond Centre and has become so well recognized that fair officials lamented the fact that, for this edition, they received far more requests than they could accommodate. This year, some 500 buyers, including jewellery retailers, travelled from Asia, Europe, the Middle East, North America, and Russia to see the products of the fair’s 83 Antwerp-based exhibitors. In addition to the show itself, the fair organized a variety of networking events, including a gala dinner, a visit to a cutting factory, and several breakfast seminars. Diamonds from 1 point to many carats, in all colours, shapes and sizes, were available at the Antwerp Diamond Trade Fair. 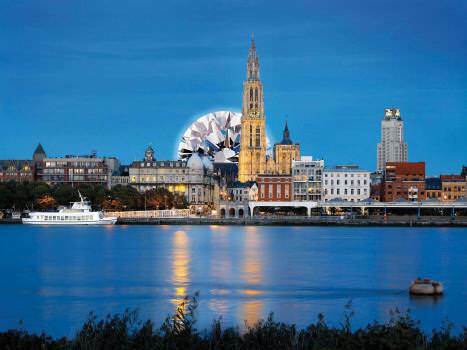 From a historical point of view, Antwerp is at the origin of the global diamond trade as it is known today. The slogan “Cut in Antwerp” embodies more than 550 years of diamond heritage, which, for centuries, has been—and still is—a trademark for high quality and craftsmanship. Today, more than 50 percent of the world’s polished diamonds and 80 percent of rough diamonds are traded in the historic city, thus providing customers a wide selection of goods. 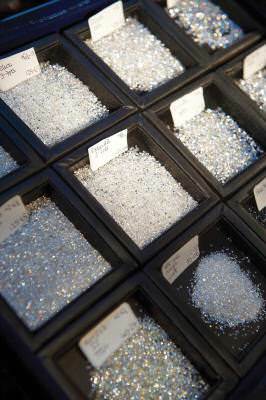 More than 50 percent of the world’s polished diamonds and 80 percent of rough are traded in Antwerp. Strolling the corridors in the two historic diamond halls provided the opportunity to see a variety of amazing stones, ranging in size from a few points to many carats, from whites to intense fancies, and from traditional cuts to unusual shapes such as fish, horses, and other forms. Willy Roth presented a variety of unusual diamond cuts, including this fish weighing over two carats. In terms of custom shapes, Willy Roth, president of Diamantclub van Antwerpen, presented diamonds in the form of horses, fish, and other creative cuts, as well as more traditional diamonds in a wide variety of sizes. Roth also indicated that the fair was good, and that he was happy with the results and the visitor traffic. 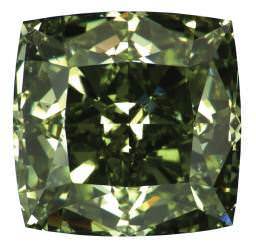 This intense green diamond, of over two carats, was displayed by Diarough. In the fancy category, Diarough displayed a remarkable intense green of over two carats, which “attracted a lot of attention,” confided Marianne Georges, who added that the fair was quite successful for the brand. 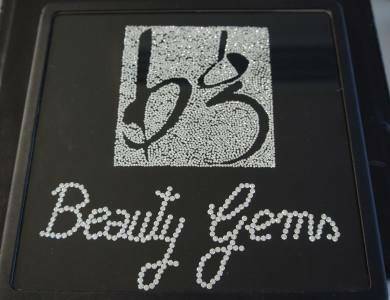 One of the more interesting booths at the ADTF was that of Beauty Gems, which attracted attention with its display of the company name and logo, completely made of diamonds (what else!). Designed by Liesbeth Cleen, the small stones of the logo together weighed 52.42 carats, while the larger diamonds of the company name weighed 33.41 carats. Cleen added that she was happy with the response to the display as well as with business conducted at the show. Assael went on to talk about Dalumi’s expansion into jewellery and the brand’s new and successful “Swana” project. He indicated that, through this project, money is given to help a small village in Botswana. “At Dalumi, corporate social responsibility is an important part of our policies and we take it very seriously,” he insisted. 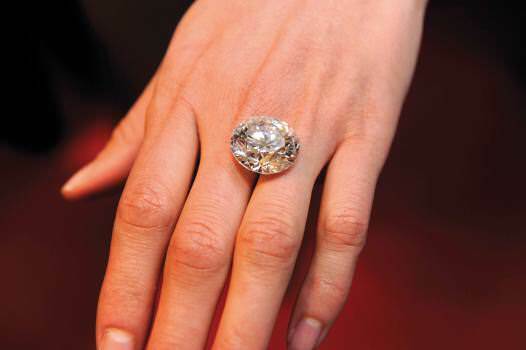 One of the larger diamonds seen in Antwerp, as it might look in a ring on the hand. “There are many challenges facing the industry,” commented Serge Zaidman, of S. Muller & Sons. “In 40 years, I have never seen the industry like this. I don’t know what tomorrow will bring, but I do know that there will always be a demand for diamonds, so we need to remain optimistic.” The company only sells sizes of 1 carat and above. “We cannot afford to do less,” mused Zaidman. Present also for the fourth time was Diamex, selling white stones from 20 points to 10 carats. Serge Beller stated that he was “very happy with the show” and noted that most buyers were from Russia, China, the Middle East, and the USA. Anecdotally, a number of retailers and other buyers from the USA and Europe indicated that the fair offered them new contacts and sources, and importantly, competitive prices. They also appreciated the historic city of Antwerp and being able to discover the charms of its cultural and architectural heritage. Peter De Deyne, Factory Manager, AMC Manufacturing Antwerp, conducted an informative tour of the cutting facility for visitors to the ADTF. 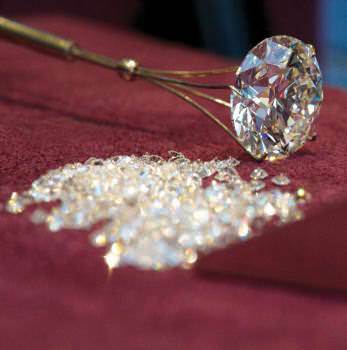 In addition to searching for diamonds, visitors were offered the opportunity to visit a diamond-cutting factory near the ADTF. Here, we were shown a variety of techniques, using sophisticated instrumentation, to determine the best cut for a stone. Peter De Deyne, Factory Manager for AMC Manufacturing Antwerp, kindly showed visitors not only the equipment used to analyze the diamonds, but also talked about the men and women who must ultimately use their experience and expertise in making the final decisions on how the diamond will eventually be facetted. 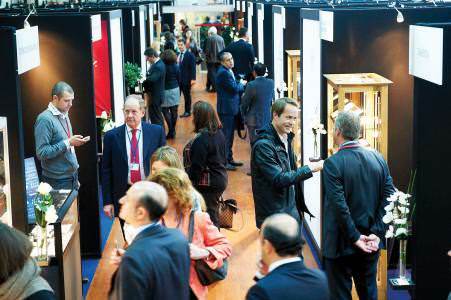 The 2014 edition of the Antwerp Diamond Trade Fair will also be held at the end of January. For more details and exact dates, to be announced, visit their website at www.antwerpdiamondfair.com.